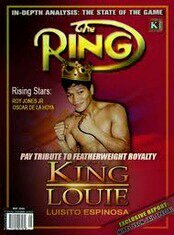 Before Manny Pacquiao, before Nonito Donaire, there was Luisito Espinosa who is The Philippines unsung hero. Known as “Lindol”, which means earthquake, Espinosa was definitely a force in the featherweight division throughout the 90’s. One boxing publication wrote about Espinosa saying that once again there was a “Thrilla in Manila”. With a tall lengthy frame and an exciting Boxer-Puncher style, Espinosa would take the featherweight division by storm. Espinosa turned pro in 1984 and won his 1st world title in 1989 at Bantamweight and defended it twice before losing in 1991. After going 9-1 in his next 10 bouts, Espinosa was able to win another world title by outpointing Mexican Manuel Medina to win the WBC featherweight title in 1995. After winning his 2nd world title, Espinosa would go on a hot streak in which he successfully defended his title 7 times over the next 3 years against world class opposition such as Cesar Soto, Alejandro Gonzalez, Manuel Medina in a rematch and Kennedy McKinney. His bout with McKinney in November, 1998 would be his career defining moment as it was his 1st fight in front of a national audience on HBO. McKinney was coming off of his career best performance by dethroning Super Bantamweight Kingpin Junior Jones by an impressive 4th round KO. The prize was the opportunity to challenge the “Cash Cow” of the featherweight division, “Prince” Naseem Hamed. Espinosa was determined to make a statement on the biggest stage of his career and did not disappoint as he destroyed McKinney in 2 rounds. The Hamed fight didn’t materialize and many believe the “Prince” intentionally ducked Espinosa. Espinosa chose to defend his title in a rematch with Cesar Soto and would lose a controversial unanimous decision. His career went into a downward spiral as he would lose 5 of 8 bouts from 2000-2005. He retired from boxing in 2005 with a record of 47-13 with 26 KO’s. Today he has crossed over into the world of Mixed Martial Arts and has trained fighters such as Nick Diaz in Boxing so they can improve their stand up fighting style. While he was on the cusp of getting to that next level of stardom, he wasn’t quite able to reach the status that his successor Manny Pacquiao has reached today. He wasn’t able to climb to the top of the ladder; however he did get his foot on it.